Changing Places: Changing places room is greatly needed and appreciated by users, but it would appear that in general they get very little use. I believe that this is partly due to signage. The facility might appear on an app but once in the building there may be poor directions. Also once found they might well be locked and someone has to go on a key hunt. Apparently some providers are closing them as they have never been used, and the average usage is once every six months. There’s been a suggestion that they could become a more multi use facility? eg first aid room; baby changing room for a disabled parent. Do you have any thoughts on this? Changing Places and similar toilets are very valuable. However, imagine you’re a shop or tourist attraction who has invested thousands in providing a large fully accessible toilet with a hoist and bench… only to find it’s rarely used. A waste of money, you say angrily, as you knock it down to make way for valuable retail space. We can break down some of the key reasons as to why they are at risk of being underused. 1) The toilet is not signposted within the venue or town. I’m a CP toilet user and so many times I find there is no signposting. I know from the CP map that the venue has one … but it’s not on any venue map, booklet, and no directions given from public toilet blocks. (O2 Arena, Bluewater Shopping Centre and my local town come personally to mind). If you don’t tell people where it is then they won’t use it! Yesterday I looked at the CP map and saw Toddingto Services had one … I went in only to find it was on the northbound side and I was southbound. Whilst it’s on the Google map section of the CP map, the description didn’t indicate which side! 2) The toilet isn’t called a Changing Places. Staff might not know that a Changing Places toilet might be labelled, in their venue, as a ‘high dependency unit’ , ‘Space to Change’, ‘Hoist assisted toilet’, ‘Adult Changing Room’ etc. as there is no official standard name. People who use these toilets might not realise to look/ask for alternative names. (Bluewater/O2 Arena / mobile units come to mind). 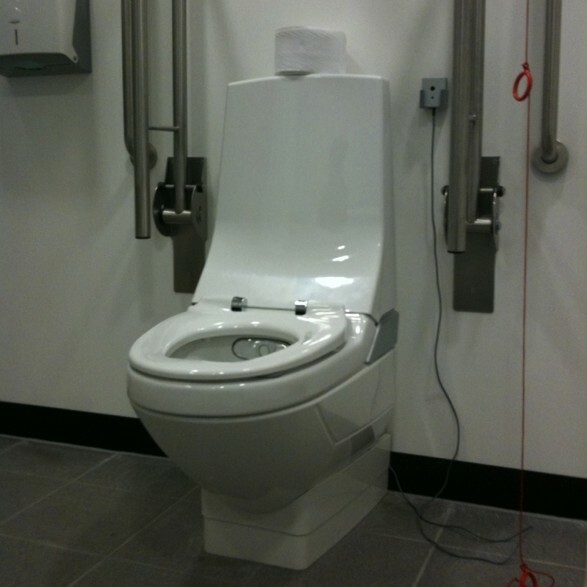 In Lincoln castle they have a hoist … but they just call it ‘the accessible toilet’. No mention of it on their visitor literature! These toilets might be a significant investment … so location is critical. Even if a large venue has a CP toilet, if you have to walk for 30 minutes to reach it, you might not use it. Maidstone has one in its council building – great only it’s over 30 minutes fast walk uphill from the museum, theatre, main shopping area etc. It’s quicker for me to drive home!! Toilets need to be central to the action. Yesterday I was at Chester Zoo. It’s a huge venue. I was a long way away from the CP toilet (about 600 metres) and it was back in the direction we had come from, so I used a basic loo. Does that count as none use or just my personal choice and need for the loo quicker than we could reach it? The location is good though and well signposted – in fact I’d say in this instance 2-3 toilets would all be used well. Sometimes too few CP toilets or wrong locations can risk low overall use. 4) How is use being monitored? Unless a person has to request one to be opened or someone is constantly watching the entrance (and this is being recorded) then usage monitoring might not be happening. Use might be ‘guessed’ by something as simple as ‘the bed paper roll’ still looks full or ‘the toilet roll hadn’t gone down in months’. These methods have obvious flaws. Thinking of the many CP toilets I have used, only 1 was visible by staff at a reception desk (who had other work to do rather than to vigilantly act as official toilet monitor). How can venues say with certainty if they are being used or not? Do cleaners make notes if it looks ‘used’? Most are ‘just toilets’ with no special key and might be used for clothing changes or something which wouldn’t leave any dent in the toilet roll. I often use my own specialist wipes that are flushable – so you’ll never know I’ve been in. Could they have other uses? Thinking about secondary uses, the two obvious choices are noted by Gill. A first aid room or for wheelchair accessible baby changing. The latter could be problematic in that parents using chairs are likely to need to sit under the changing table area to access their baby and CP benches are not open underneath. A height adjustable baby changing table might be an option that could fit in the full size CP toilet to assist disabled parents. What about using it as a first aid room? There is nothing in health and safety legislation to suggest that a toilet space can not be a first aid room. However, whether someone would want to be treated in a room with a toilet nearby could be a problematic. Hygiene and infection control may be an issue and CP benches are often just a shower trolley – not meant for laying on for a prolonged period and not that comfy. There is also the consideration of what you would do if the room is being used and you needed the toilet or someone needed first aid. How likely this is to occur will depend on many factors. Location of the toilet and size may influence any decision to have a multi use room. For small to medium stores etc, multi use may be worth considering with the addition of a chair and first aid cabinet/wall mounted kit. I see a simple solution. You don’t HAVE to use a bench or hoist to use the facility. Why not just have it as a toilet for use by anyone who would normally need an accessible toilet? Do disabled people in general know they can use it? Currently building regulations say that venues need a standard wheelchair accessible toilet … and CP toilets are additional. Well perhaps this should change – the only difference would be a finger wash basin near the toilet (and this could be fitted in a CP toilet as a moveable / swing out basin perhaps). That way one toilet suitable for all could be provided. Even going as far as enabling parents with children in prams to use the room in smaller venues where low use might be a financial issue? Maybe, in small venues, we need to start providing shared facilities that serve more than just disabled hoist/bench users.